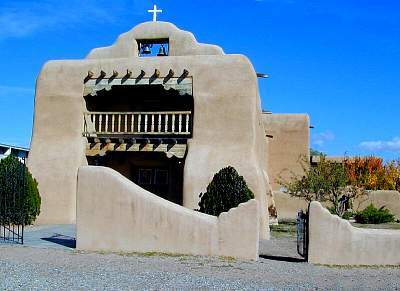 Our first day excursion took us NNW of our base in Santa Fe, NM on Routes 84/285. 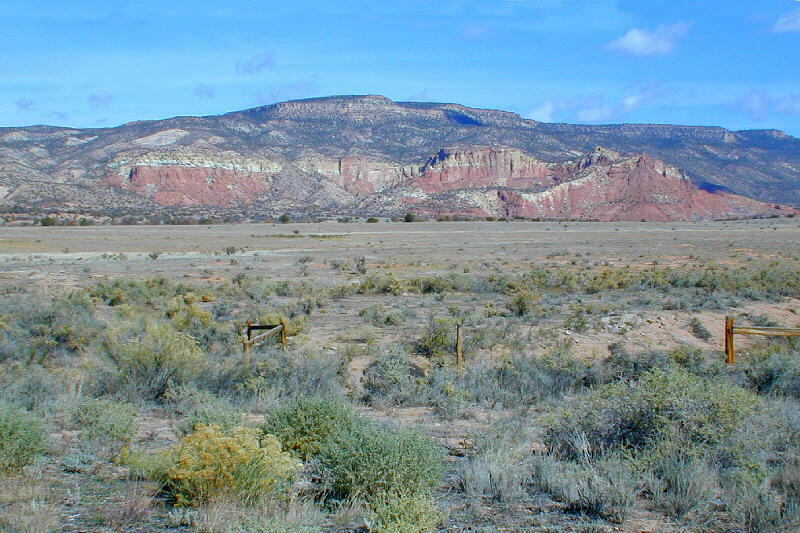 We were greeted by these spectacular scenic views of deep blue sky, puffy clouds, and a landscape of scrub oak, pinion pines, and sage brush. 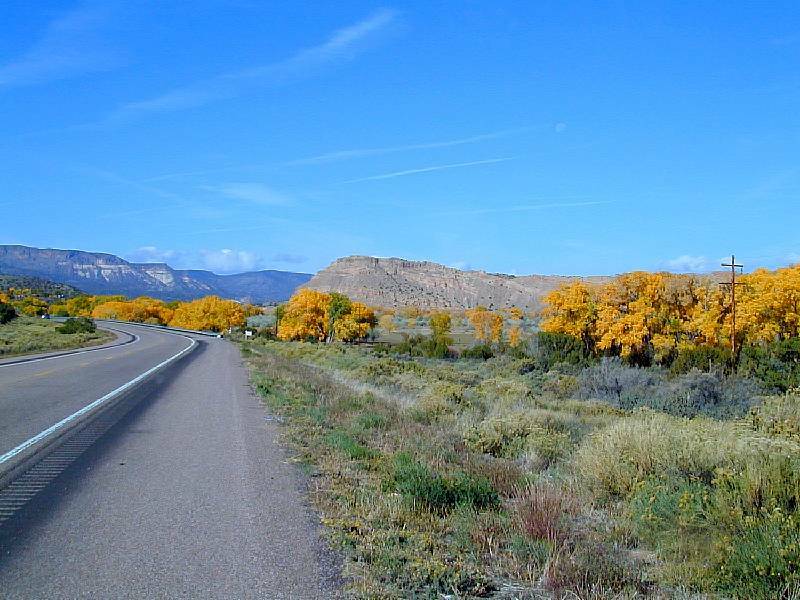 We also got our first glimpse of the blazing yellow of the Cottonwood Trees in Autumn. 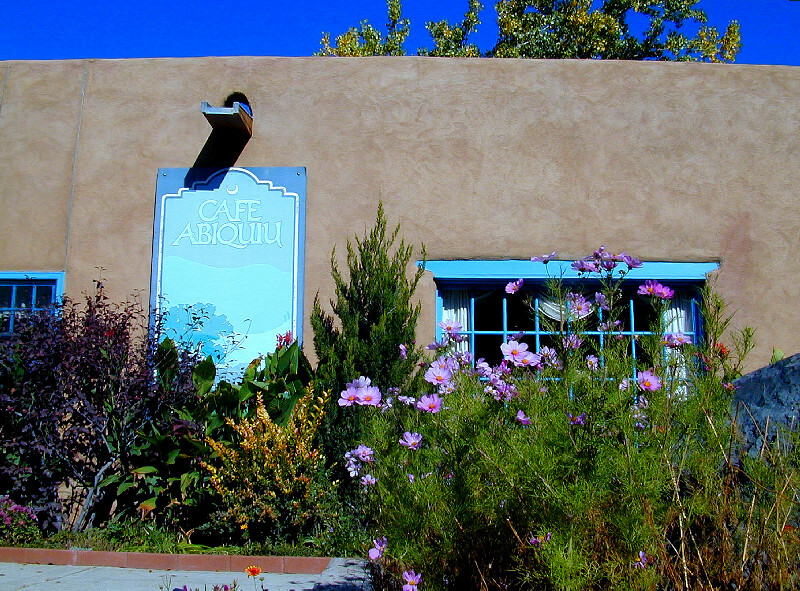 Our first stop was at the small town of Abiquiu, about 25 miles out of Santa Fe. 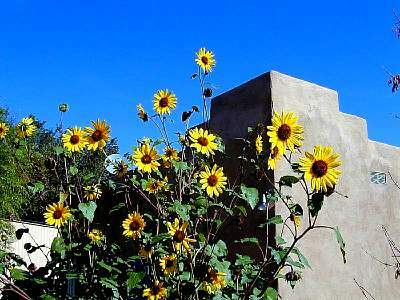 We couldn't resist a photo of these black eyed susans against the deep blue sky and brown adobe. This is the quaint Abiquiu Inn and Cafe in the traditional New Mexican adobe style with beautiful Northern New Mexico fauna. 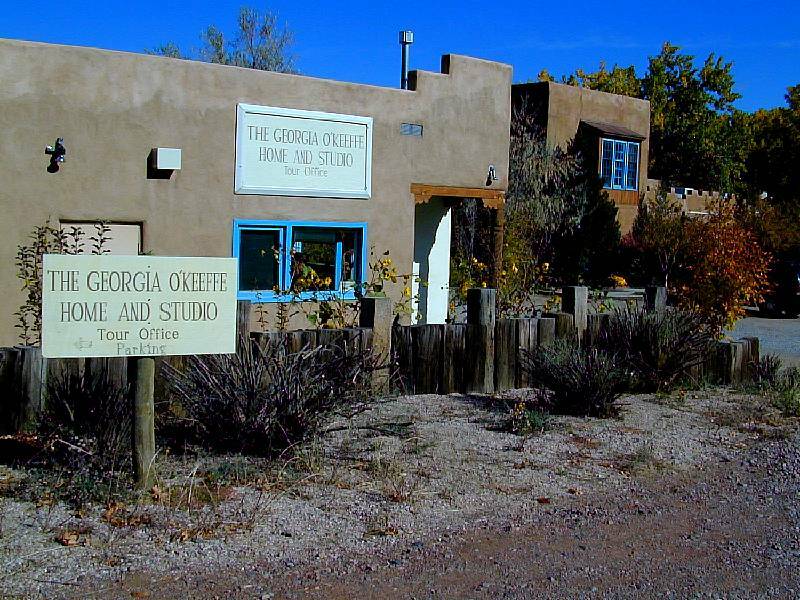 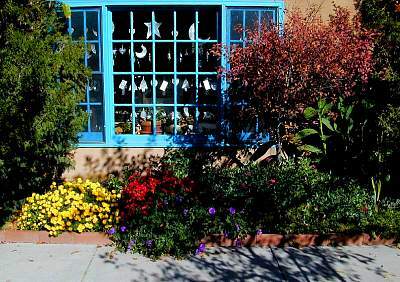 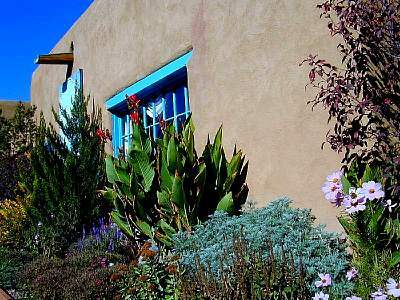 Next to the Abiquiu Inn is the Georga O'Keeffe Home and Studio Tour Office which coordinates guided tours of the famous artist's 5,000 square foot Abiquiu home and studio. 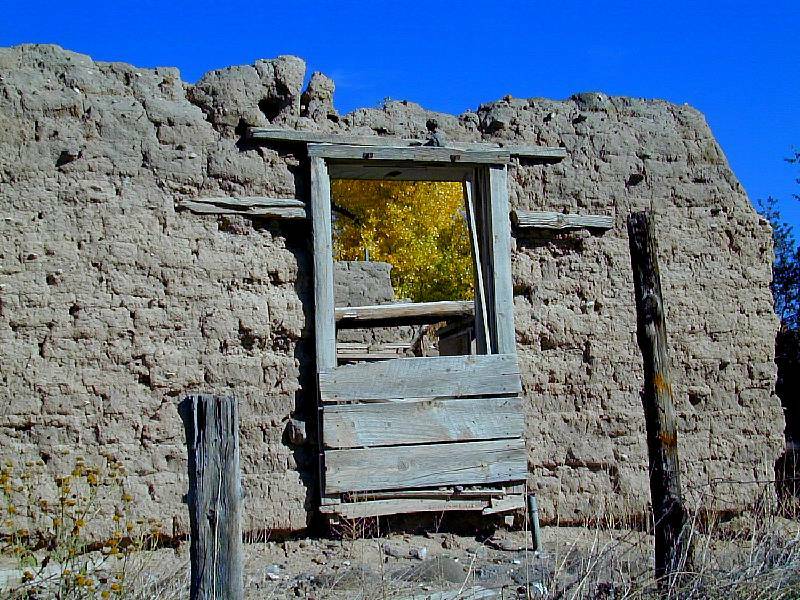 Unfortunately they were fully booked. In fact you need reservations 3 monthes in advance! About a half mile up the highway off to the west, we drove up a small road to find the Abiquiu town center with this beautiful adobe church. 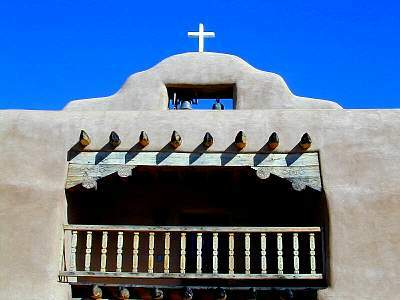 A detailed view of the top of adobe church in Abiquiu. 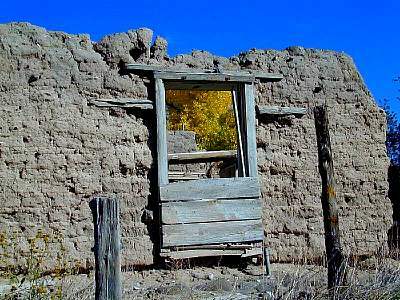 This old abandonded adobe structure was across from the church in Abiquiu, and once again we get a glimpse of the blazing yellow Cottonwood Trees. 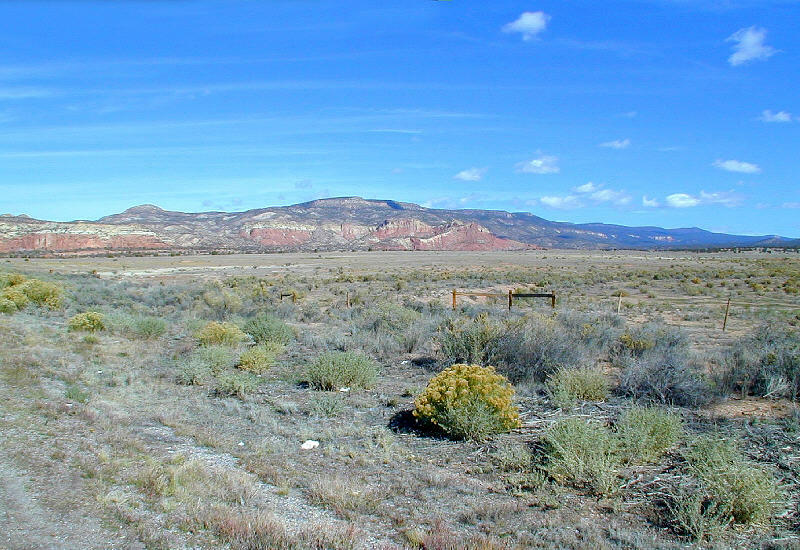 This panorama of 4 photos was taken along the highway just north of Abiguiu. It really doesn't do justice to the true blazing yellow of the Cottonwood trees that we saw with the naked eye along the Sangre de Christo Mountains. 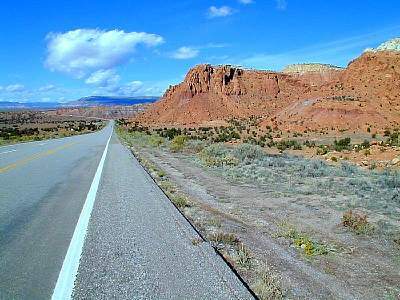 This was taken along the highway just north of Abiguiu. 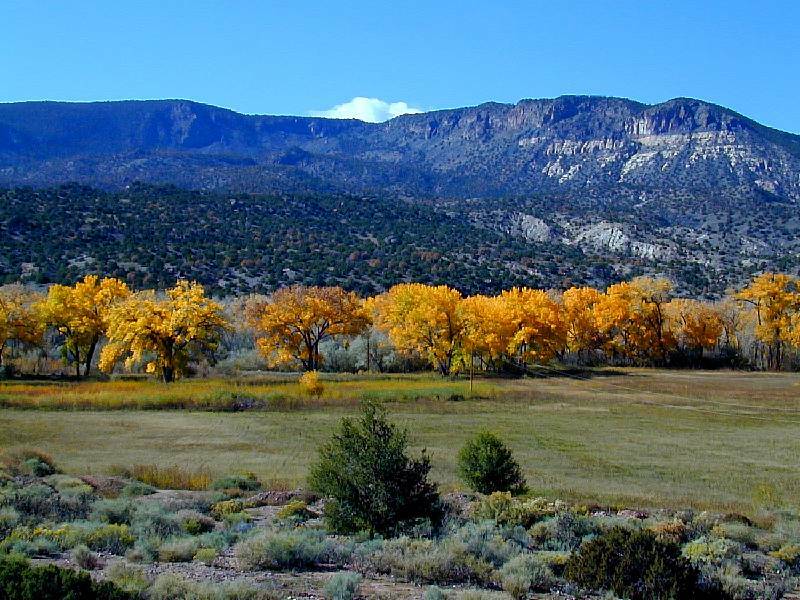 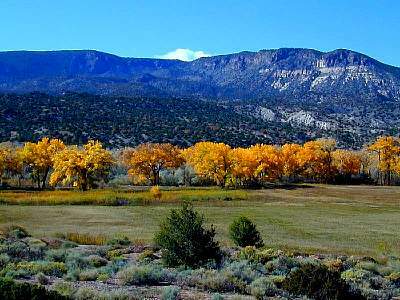 You can almost get a feel for the true blazing yellow of the Cottonwood trees that we saw with the naked eye along the Sangre de Christo Mountains. 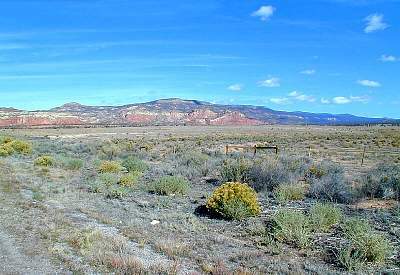 This is the Abiquiu Reservoir, about 6 miles further north of Abiquiu. Reflected in the Resevoir is Georgia O'Keeffe's favorite Mountain, the Pedernal. 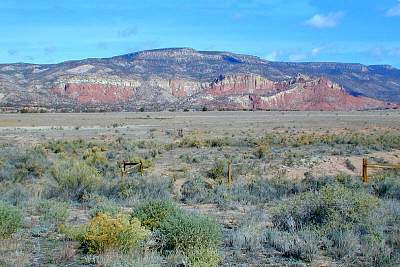 As we travel further north on Route 84, we see the sage brush terrain with the beautiful red, yellow, and grey cliffs in the background with the deep blue sky and puffy clouds. 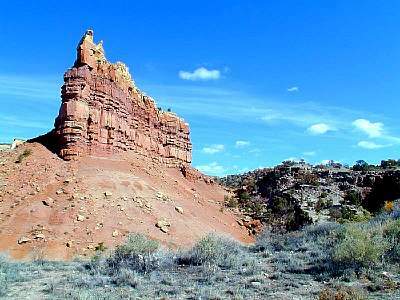 These beautiful red and yellow rock formations are along Route 84, north of Abiquiu and just south of Ghost Ranch, where we are headed. 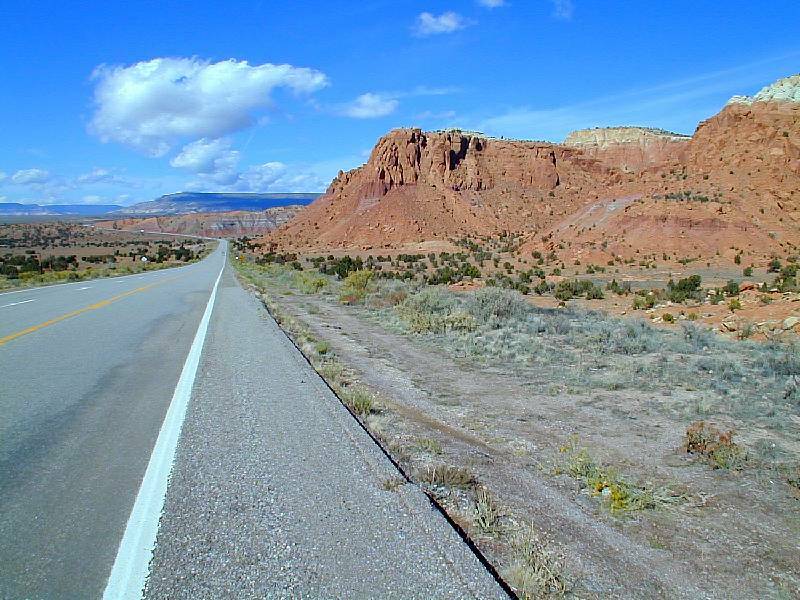 Looking north along Route 84, north of Abiquiu and just south of Ghost Ranch, where we are headed.